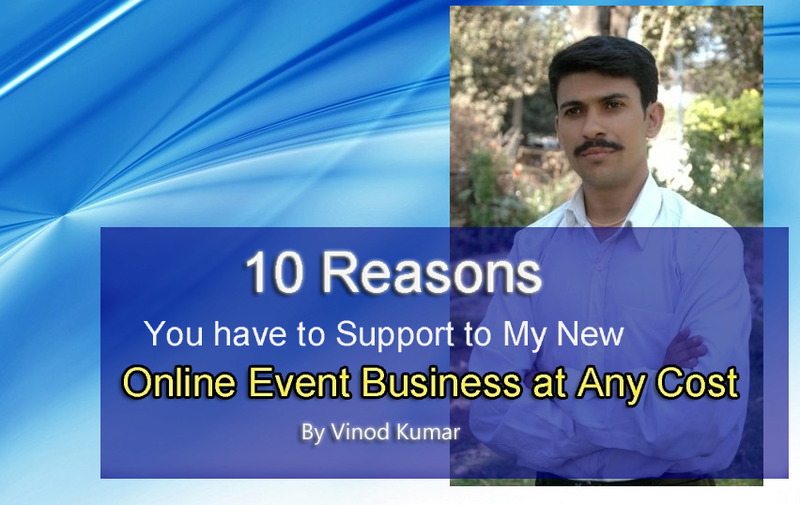 10 Reasons of "You have to Support to My New Online Event Business at Any Cost." You can ask me, "You are doing business and what is the need of my support." For answer of this question, I had written these 10 reasons. I am fully hopeful, after reading it, you will come forward to support to my new online event business at any cost. I have started my new online event business from this month. My event is upcoming in end of next month and its name is "My 2 Biggest Mistake in YouTube 2 Times". This event's ticket price is Rs. 500. Every sale price of event ticket is my revenue which you will buy. You have to buy this ticket by paying Rs. 500 because you have obtained big lesson from past biggest mistakes. If you forget, I can remind you. I was listening music on my mobile in Aug. 2012 and slept on the train and lost my mobile. I went Police Station and wrote FIR for my lost mobile. I thought, there are lots of people in the world who do not know to write the FIR for lost mobile. So, I taught you, "How to Write FIR for Lost Mobile?" on my website in past. Now, You have to give its price by buying my Ticket of ""My 2 Biggest Mistake in YouTube Live Event ( 30th March 2016) as the price of past learning. It is also sure, you will get new lesson from it. Due to my biggest mistakes in Bike driving, I faced road accident. I faced the risk of my life and Got big lesson of my life. I shared my knowledge through two video tutorials. You have watched both videos and you have saved from accident and saved your life. Again you can remember this by watching it again with following both videos. Now, you have to take the decision to buy my this event's ticket. Who is in the world who share his mistakes. No, there is no one in the world who share the mistakes because he or she fears that it will make him or her idiot or fool. Everybody tries to hide the mistakes. But I am only single in the world who is sharing my biggest mistake because I am interested to become idiot and fool as per your thinking but as per my thinking, it is my way of teaching. I want to become the teacher of whole world without any selfishness. I want to help other not to do biggest mistakes. So, I have to share it. Its story is very interesting. "One day, I am teaching the driving the car to my friend first time on the road. This is my mistake. First time, never teach driving on the road. Due to this, my friend did accident on the road. I had to pay the penalty for this. I have to pay big cost for repair my car because I did not teach my friend, never start the car in first gear. So, my friend started car with first gear and car went automatically forward and due to this, we have to lose our big money. Moreover, I did not teach the break to my friend. So, I shared my this biggest mistake through Video and you including 28669 people watch my this video and if you have forget watch it again. You have to pay its cost of my new event because I am mad for my this new business. I am mad because I have work hard to teach you the lesson which I have gained through my biggest mistakes in this live event. I am mad because I have full confidence, I will get success in it. I am mad because I am seeing great opportunity in this business. I am mad because it is my first event in my whole life. I am mad because this event is not product which I am selling. it is the key of your success and your success is my success. Everyone who come here to read and great target and mission. When you have reach its 3rd point. It means, you have read its 2 above point. It means, you have become my reader. Without writer, there is no existence of a reader. Same will apply on my new business. You will do best to support my business because still you need my support for the success of your business. I have done work hard to write this content. Now, you have come to read it. By reading my content, I have become successful writer. But, you did not come without purpose. You need my content. So, you have come. You need my words. So, you have come. Same will apply on my new business. I have invested my big time to create the video content. Same time, I can enjoy in picnic but I did not because I care your need. So, you will surely buy my ticket of event because it will complete your need not my. I have enough money, I can buy people who can buy my ticket. "It is sure, you will get 1% click through rate who will buy your product." I know also simple accounting. If I have to do advertising, I need to include the cost of advertising in product's price. Neither it is my product nor I am using outside advertising. So, my ticket cost is the lowest price. I am not interested to buy the people through advertising. I respect, human being. If a single person in this world who will buy my Ticket of Rs. 500, it will be my great success of my life because I have to teach human beings through this event not the sold people in the advertising market who have money and who can buy everything only due to the power of money. I know there are lots of Indians who do not earn even Rs. 500 in whole month. But still, they have power to give the donation of Rs. 1000 for selfless purpose. I need such great person. So, I have decided not to waste money through advertising. If you do not have money, I will give you free ticket if you just spread my message to your friends. It is my advertising cost which I can pay you the free ticket to you. I am using YouTube ( through my Svtuition Youtube channel ) for 7 years. But now, my own online Video Hosting for my Free Online Education Mission. So, I will donate whole collected money from selling of these tickets. So, every amount will be include in the donation amount. Instead of demanding donation for this cause, I have started my new online event business and your support will help me to grow in it. A single mistake is important because you are using YouTube which is second world's famous search engine. Google's own Google Video was failed. So, it had bought YouTube by Paying big amount. Whole history, you can read on Wikipedia. In this world, YouTube has affected all the peoples like teacher, educators, businessman, businesswomen, advertisers, students, actors, engineers, doctors, patients, organisations and companies. Because if one image is equal to 1000 words, then one video is equal to 1000 images. So, you can understand YouTube gives the facility to upload and watch the videos. If you have done a single mistake in it, you can know its result. But I have done total 4 mistakes. 2 Biggest mistakes 2 times. So, it will surely satisfy to you that you have learned great lesson which you can not find any video on youtube. I spent my 7 years day and nights in YouTube. Who can know better YouTube than me. My Single day's cost is more than Bollywood and Hollywood actor's whole film fees. If Salman Khan takes Rs. 60 Crore for one film, I will take Rs. 60 Crore doing the duty of other. I am Azad. So, this event will also give whole knowledge of my 7 years experience within few minutes in this live event which you can watch on 30th march 2016 after buy its ticket. I am always against gambling. In past, I had made the free course for leaving this addiction. So, my ticket is not the part of gambling scheme or giving you greed. a) This Rs. 5,00,000 profit will be in kind. Means, your business will more grow after this. You have to buy this ticket because it will save you from your big loss. For example, you appoint the CA for auditing the accounts. Why? Because he or she check or deduct the mistakes. Am I correct? Same CA service will be helpful for saving you from big loss. Like this, I am also CA in your online business. My Event will also help you to save from big loss. Love does not see day and night. Love does not see poverty and richness. Love does not see good or bad. Love does not see the price. Love does not see the cost. I have trust on you. You love me. So, you will not wait next day. You love me, you will not see your blank pocket. You love me, you will not see your own selfishness. You love me, you will not see the price of my ticket. You love me, you will not see the cost of ticket. At any cost, you have to buy my ticket because you love me. Yes, you love me. Accounting Education: 10 Reasons of "You have to Support to My New Online Event Business at Any Cost."